Development of cottage village on the land lot with area 25.62 ha, which is situated on the bank of Klyazminskoe reservoir within the administrative boundaries of *** village of Mytishchi district of Moscow region. Kind of rights: ownership, without encumbrances. Land category: land of settlements. Temporary permitted use: for individual housing. Adjacent land lots: in the south – Klyazminskoe reservoir; in the west – Senkovo village; in the north – Novoseltsevo village; in the east – *** village. Access road: to the border of land lots. Electricity: dedicated power is 2МВА. Sewage: Domestic Lifting Station (DLS) on the territory of «Novosel'skii mechanical plant». Water supply: documents for license obtaining for water supply are handed over. Gas supply: on the border of land lots. Within the framework of research the price characteristics of households of organized suburban market are considered. An average cost of 1 m2 of cottage in general by the analyzed market is about $***, of townhouse – $***. In present moment the tendency of increased interest in finished or under construction cottages is observed. On the one hand, the buyers became more confident in their future. On the other hand they are bent on organization of the project including construction and infrastructure seeing that settlements without a contract are developed a few times slower than projects with a contract, etc. 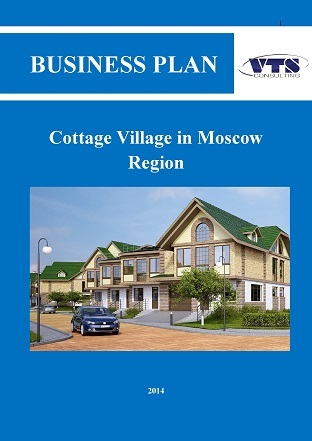 So ***% of clients are ready to buy the cottage which is situated at the Dmitrov highway in the local zone. The purchase of land lot is considered by ***% of company’s potential clients (against ***% a year ago). The demand for townhouses and apartments is significantly less and amounts to ***% and ***% accordingly. But in such case it is necessary to take into account two factors: the local market does not abound with qualitative available supply in this segment and also that apartments and townhouses are the first step to suburban life, an interest to which are manifested by increasingly wider population with each passing year. The category of cottages for «final finishing» is leading in the structure of demand – ***%. Most of households buyers would like to develop a design of own house themselves. Each fifth potential buyer is ready to furnish his house himself and consider the variant of cottage purchase for «rough finishing». The minority of clients (***%) would like to buy a completely ready for leaving «turnkey» house. ***% of clients are interested in purchasing of a townhouse for «final finishing». Another 3% of potential purchasers are ready to buy the household of similar format with «turnkey» finishing. The less number of clients is interested in purchase of apartments. At that the majority prefers to buy the similar properties without finishing.